At a party with friends, it might seem totally innocent to grab a cup of soda for a nice mixed drink. But what if you buy a soda—or three, or four—every single day? But really, what’s so bad about soda? 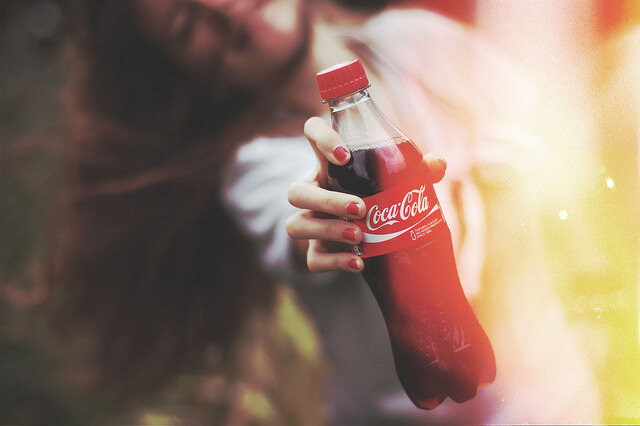 Coca-Cola ads make it seem as though the bubbly, fizzy drink is what’s bonding us together. Unfortunately, that’s not the truth. Soda isn’t bonding us together…it’s killing us. Soda is terrible for you, and we are drinking it more than ever. “Compared to 30 years ago, our consumption has tripled,” says registered dietician and author Liz Pearson. That’s because soda is readily available anywhere…and people don’t realize just how terrible it is for you. Here are 21 reasons why you need to ditch soda for good. How does that work? “Soda contains phosphoric acid and is well known to interfere with the body’s ability to absorb calcium,” says Rene Ficek, registered dietician and lead nutrition expert at Seattle Sutton’s Healthy Eating. That can lead to—you guessed it—cavities and enamel rot. You may have guessed that soda can lead to an extra pound or two, but you may not know just how susceptible you are to gaining weight if you are a regular soda drinker. “The over consumption of soda is partially to blame for the country’s obesity epidemic, and surely has contributed to 50% of the population being at least 20 pounds overweight,” says Frank. Need more proof? According to Pearson, “no other food or drink has a stronger link to obesity.” Yeesh. 4. …and makes you crave fatty foods. Not only is soda totally packed with calories, but it can actually make you crave even more calories, according to chief clinical dietician at Cassena CareFelice Kosakavich. “[Drinking soda] can lead to a false sense of hunger causing cravings for more sweets,” says Kosakavich. If you find yourself reaching for a candy bar, it could be that soda that’s to blame! 5. Specifically, soda can cause belly fat—one of the most dangerous types. Are you finding it harder to button your jeans? Listen up: “The high sugar content of soda has been conclusively linked to an increase in abdominal fat-which is dangerous, as this is where many vital organs are,” says certified nutritionist and fitness trainer Franci Cohen. Protect your organs and put down the soda! 6. Soda has way too much sugar. Clearly, soda has sugar. But that’s not the problem. As Teitelbaum points out, this means that a 64 ounce soda has approximately 48 spoonfuls of sugar…ugh. Sure, 48 spoonfuls of sugar is a lot, but why is that so bad? Carolyn Dean, Medical Advisory Board Member of the Nutritional Magnesium Association gives us a new perspective. 8. …a sign of diabetes. Fatigue is rough…but that’s not the worst of it. “Over time, this push and pull on the pancreas to produce more insulin and the cells to accept more sugar results in depleted insulin and insulin resistance of the cells—diabetes,” says Dean. 9. The artificial sweeteners in diet soda are just as bad. You may think that switching to diet soda to avoid that excess sugar will help, but not so fast. “Artificial sweeteners still induce the release of insulin causing the same metabolic syndrome, insulin resistance and ultimately, diabetes, that regular soda does,” says Hollywood cardiologist Dr. Adam Splaver. 10. The more you drink soda, the less you hydrate your body. Bored of water? “My favorite substitute [for soda] is some flavored sparkling water (try lemon or lime) with a splash of cranberry and a twist of citrus,” says fitness expert Jennifer Galardi. 11. You can actually become addicted to soda. That craving for cola may not just be in your head—your body could actually be addicted. 12. There is literally no nutritional benefit whatsoever. So you like drinking soda because it tastes good. Hold on tightly to that excuse, because there is literally not a single other one out there. 13. In fact, soda can actually lead to malnutrition. Not only does soda have no nutritional benefit itself, but it can lead to malnutrition itself through under-consuming nutrient-rich foods, according to Kosakavich. “Children are drinking soda instead of milk, which is limiting adequate amounts of calcium for adequate bone growth,” warns Kosakavich. Soda is also packed with phosphoric acid, “which can interfere with the body’s ability to absorb calcium and other essential nutrients,” according to Tessmer. Ick…does that soda still taste good to you now? Soda can steal those important nutrients from your bones, leading to osteoporosis. “Beyond the sugars, sodas also contain phosphoric acid, which is known to promote osteoporosis or bone loss by leaching calcium from bones, as well as benzoate or benzoic acid,” says Splaver. 15. …and studies have shown that soda can cause cancer. According to Splaver, when left in hot temperatures, that benzoic acid can transform into a scarier chemical: benzene. “Ever notice your soda tasting chemically ‘off’ when it’s been stored improperly? That’s benzene you’re tasting, a known carcinogen or cancer causing agent,” said Splaver. In fact, the coloring used to make Coke and Pepsi “blackish” have been found to cause cancer in animals, according to Cohen. “Scientists caution about the cancer risk for humans,” Cohen warns. 16. Soda can create kidney stones. Anyone who’s had to pass a kidney stone knows that it’s one of the most painful experiences ever, so perhaps this will serve as good motivation to quit: soda can cause kidney stones, says Pearson. According to Chang, “the kidneys are put under massive stress, causing mineral imbalances, which can produce kidney stones.” Ouch. 17. It can destroy your liver. In fact, “soda’s effects on the liver have also been known to cause the same kind of kidney problems that plague alcoholics,” according to Chang. Makes that Pepsi bottle look like a totally different kind of bottle! Pearson adds to this, claiming that soda can make fat accumulate in the liver, “causing inflammation and scarring,” says Pearson. This can progress to liver failure. 18. Soda can make you older, faster! Not only does soda make you fat, but it can affect your beauty in a totally different way: accelerated aging, “due to the high levels of phosphoric acid in sodas,” according to Cohen. 19. Soda can make you infertile. Future parents, listen up: a can of soda can actually affect your ability to have children. “Aluminum soda cans are lined with an epoxy resin called BPA, which may interfere with your hormones, effecting infertility,” says David Zulberg, author of The 5 Skinny Habits: How Ancient Wisdom Can Help You Lose Weight And Change Your Life Forever. 20. Soda can make you unhappy…literally. All of these nasty effects can have an effect on your psyche. Soda can promote anxiety and depression. “Not exactly what I would call ‘liquid happiness,’” says Teitelbaum. 21. All of this is because soda is packed with dangerous substances with complicated names. Yeesh. There is nothing natural about soda whatsoever! “Any substance that can physically addict the body, cause teeth to rot, and can clean a corroded car battery can’t possibly be a smart choice for a midafternoon pick me up,” says Frank. Soda may be available wherever you turn, but do your body a favor and stay away from it. To pour such nasty stuff into your system is to poison your body. There is no nutritional benefits from soda whatsoever, and experts agree that soda is the worst thing you can do to yourself. Remember: you only get one life.